Lip Service is the Belfast, Northern Ireland, Rocky Horror Picture Show performance group. It was officially formed in early 1993 by Roisin Brady, Darren McIlroy and Davy Orr, like minded Rocky Horror fans from around Northern Ireland who regularly attended the showings of the film at the Queens Film Theatre. Up until this time only a few members of the audience appeared in costume with a couple of props, shouting the odd line. Many performance groups choose their names from lines of the film dialogue; Creatures of the Night, Sins of the Flesh, Crazed Imagination. In Belfast however the name virtually chose itself. It was chosen in honour of the one and only Patricia Quinn, who played the original Magenta character on both stage and screen. As Patricia was born and raised in the city of Belfast, and it was her lips which introduced the film version and therefore became synonymous with Rocky Horror throughout the world, the name seemed a logical choice. Along with Lip Service the main United Kingdom groups include Franks Angels, Edinburgh, Dr Scott's Extra Fork, Glasgow, and Charming Underclothes, London. Standards between each group can vary considerably, as does the number in each cast, but the one common factor is their love and enthusiasm for the film! The members of the group wear copies of the costumes of the characters on screen which they supply at their own cost. Most of the groups costumes are either made by themselves or Saffron Shearer from the Glasgow group. As with most performance groups in the United Kingdom, Lip Service are not paid. The group start a film screening with a pre-show. This usually consists of the cast miming to a number of songs/sketches, the purpose being to help build up the audience anticipation and an element of participation before the film actually rolls. Those members of the cast not actually performing at that time in front of the cinema screen or frantically carryout a costume change in the shadows will help to encourage the 'shout back' dialogue. Most of the members of the group are members of the British fan club TimeWarp and the International Rocky Horror Picture Show, fan club based in New York. In fact Davy Orr, one of the Belfast group is the only recognized Representative of TimeWarp outside of Tonbridge in Kent. Lip Service members have appeared in various publications and newspapers throughout the UK., including the recent '21st Anniversary Tour Brochure' for the Rocky Horror Show. Some of Lip Service met up with some of the Glasgow cast and traveled onto Northampton, England where Anglia Television interviewed them for their 'Weekend' programme based around a stage performance of the Rocky Horror Show. Ulster Television in conjunction with Cool FM Radio ran a showing of the film at the Queens Film Theatre, Belfast when they interviewed the group members, filmed them getting ready and then performing. On a number of occasions group members have also been interviewed on BBC Radio Ulster and various articles have also appeared in local newspapers advertising showings of the film and performances by Lip Service. Photographs of the group appeared in the recently published book 'Creatures of the Night II' by Sal Piro (President of the RHPS Fan Club, New York) celebrating 20 years of the film version and the activities of the fans. Lip Service members have attended both "Transylvania '92" and "Transylvania '94 - The Second Coming", the last Rocky Horror convention in the UK, where along with the other three main performance groups in the country they performed a pre-show before the midnight showing of the film. Davy Orr also co-ordinated security for the International attendees and VIP's. In fact most of the group helped out as Stewards on the day. In July 1995 the group performed with Patricia Quinn at the Warehouse, a club in Belfast to promote the 'Alive in Belfast' compact disc. When the West End stage production of the Rocky Horror Show came to the Grand Opera House, Belfast the group offered their services in helping to promote the show. This involved publicity photo's for local newspapers and the distribution of flyers etc. Around pub's and clubs. Such is the dedication of some the group that they attended all eight performances of the stage show while it was in the Grand Opera House, Belfast. Strangely for a performance group, a large number of Lip Service prefer the stage show to the movie version! 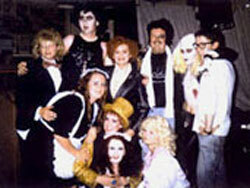 At the time of writing, on Halloween Night 1996, Lip Service are again performing with Patricia Quinn, this time the event is being billed as a Rocky Horror Night with a fancy dress competition the Belfast performance cast shadowing to the film and Patricia judging the fancy dress and singing. All activities of the group and screenings of the film we attend, providing we have enough warning are advertised in the TimeWarp Fan Club magazine and also on its' telephone information line. Such is the camaraderie within Rocky Horror, that on occasions when some of the Belfast group have been unavailable for performances friends and fellow 'Rocky' fans have traveled from other parts of the United Kingdom to help out. At every film performance in the Queens Film Theatre we give out newsheets to the audience. These contain more information of a Rocky Horror nature, recent activities of the group, advertisements and the all important etiquette.